Demand more from the mid-size market than mere power. 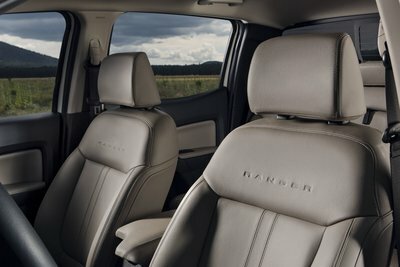 Instead discover premium comfort - with the 2019 Ranger delivering class-leading convenience. Ford has tailored this truck for riders, rather than just rough roads; and each mile will be paired with supple support. As CNET explains, the new Ranger proves more than an all-terrain beast. It’s also a family-worthy pick-up - with its cabin boasting both space and comfort. The long wheelbase (126.8-inches) easily accommodates up to four passengers, with ample head (39.8-inches, 35.9-inches), shoulder (55.6-inches, 55.2-inches), and leg (43.1-inches, 30.4-inches) room available. Bucket-style seats offer either cloth or leather; and lumbar support pairs with power adjusters for superior alignments. Optional heating functions bolster the cushions, while dual-zone climate controls promotes precise temperatures. The column features tilting/telescoping capabilities, allowing drivers to customize their steering angles; and an excess of soft-touch materials, including Nubuck Edge carpeting, ensures a luxurious experience. To further emphasize comfort, the 2019 Ranger also features an Intelligent Access console. Experience push-button control over the engine and climate systems - eliminating the need for clumsy keys. All entries are seamless and quick, enabling drivers to more efficiently start their adventures. Want to experience the best in mid-size styling? Visit our dealership today to learn more about the new Ford Ranger! Take control of every mile in the 2019 Ranger. This Ford pick-up (which is the smaller, but no less potent, cousin of the F-150) makes an auspicious return to Alberta, connecting drivers to all-terrain performance and seamless capability. Go Further indeed. According to Wards Auto, Ford is bringing off-road power to the mid-size market - pairing its 2019 Ranger with the available FX4 Package. This bolsters every sequence, utilizing a suite of advanced technologies to improve handling and increase control. An electronic differential anchors the rear, enhancing traction through its exclusive locking functionality; while electric power-assisted steering promotes crisp handling. Deep-treaded tires yield an impressive stance, taking advantage of the truck’s sporty dimensions (211-inches in length, 86-inches in width, and 72-inches in height); and mono-tube shocks have been specially tuned for rough terrains, increasing the suspension’s overall flexibility. Worried about those unfamiliar paths? The Ranger will accommodate them all, pairing a front-mounted steel bash plate with integrated skids. These protect the truck against debris, ensuring that the motor, transfer case, and fuel tank are all shielded. 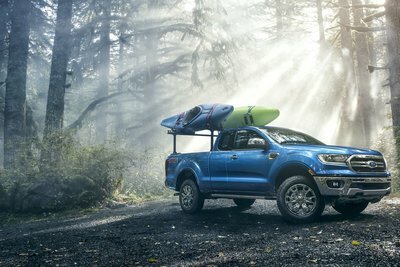 The 2019 Ranger proves ready for off-road fun in Alberta. To learn more about this Ford pick-up (including further specs and financing information) visit our dealership today. A second proves fleeting - with nothing exciting, you're sure, able to occur within such a short burst of time. It’s insignificant; it’s unimportant; it’s… exactly how long Ford needs to conquer the sales charts. According to the Detroit Free Press, the 2019 F-Series proved an unstoppable force last year - with every 29.8 seconds yielding a sale! The F-150, F-250, and F-350 dominated the charts, effortlessly revving past competitors; and Ford earned a staggering 1.1 million in total truck purchases from January to December, shattering previous records with ease. 2019 F-150 Towing Capacity: 8,000 pounds. 2019 F-250 Towing Capacity: 13,300 pounds. 2019 F-350 Towing Capacity: 18,000 pounds. Anchored by a class-leading engine suite - which includes the 6.7L PowerStroke engine, connecting Alberta drivers to 450 HP and 935 lb.-ft of torque - the F-Series is ready for every payload. Experience turbocharged capability and six-speed precision with each press of the pedal. 2018 was the year of the pick-up - and we see no reason why this trend won’t continue for the months to come. To learn more about the new F-Series (or to schedule a ride in one of our available models) contact us today! With the release of the 2019 F-150 Limited drivers find themselves celebrating speed. Anchored by a high-output 3.5L EcoBoost V6, this platform generates 450 HP and 510 lb.-ft of torque - bringing Raptor-worthy performance to the Alberta highways. Revving from 0 to 60 demands approximately five seconds, and achieving a quarter-mile blitz requires only 13.7 seconds. This platform can fly. With quick speeds, however, comes a need for smooth stoppage - and this is why Ford has paired the 2019 Limited with a dynamic braking system. As Car Buzz explains, this pick-up boasts vented discs. These respond seamlessly to every press of the pedal, engaging each wheel to deliver a full-stoppage distance of just 168-feet. AdvanceTrac technology anchors the system, increasing stability through integrated gyroscope sensors; while Trailer Sway Control activates with the push of a button, automatically funneling torque to the rear to improve balance. Understeerage is reduced through an electronic locking differential, and a rack-and-pinion column connects directly to the ABS and provides nimble handling. 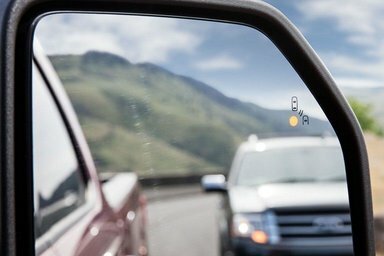 These technologies ensure dynamic deceleration - with the new F-150 able to accommodate straightways and sudden turns alike. Drivers will confidently navigate every mile. To learn more about the 2019 Limited contact our team today! It’s a trick you’ve never mastered - hitching a trailer on the first (or second) try. You reverse, retreat, and start the process again. The angle is never quite right, and the receiver always seems farther than you originally measured. Making a connection proves a struggle on even the best of days. The 2019 F-350 can change this. To ensure that drivers can seamlessly conquer their payloads, Ford has fused this F-Series platform with Dynamic Hitch Assist - an exclusive technology that simplifies every reversal. Engage the system with the press of a button, automatically receiving real-time video feeds from the central eight-inch LCD display screen. High-definition pixels will reveal a 180-degree perspective, as well as a series of color-coded gridlines. These will showcase the most effective back-up routes, with operators able to quickly gauge distance and trajectory. Ensure a smooth hitch connection with this F-Series system - following the projected path as you reverse. The trailer position will be highlighted, and the need for a secondary spotter will be eliminated. Ease is assured. Dynamic Hitch Assist allows drivers to dominate every payload. To learn more about how this feature bolsters the 2019 F-350 contact our team today! It’s an easy oversight - with all attention given to the 2019 F-150 Limited’s impressive speed, every thought dominated by V6 performance and a 0 to 60 rush of five seconds. How can drivers focus on anything but pure full-throttle power? We understand the fixation - but we also believe the this F-Series model delivers far more than high-output capability. It also offers a dynamic fascia that will impress with every mile. As Car and Driver explains, the 2019 F-150 Limited serves as the market’s most potent pick-up. It’s also undeniably striking. A satin-finished grille anchors the platform, pairing silver inserts with chrome-plated bars. LED lighting follows the sporty lines of the fenders, while power-deployable running boards emphasize the hulking dimensions (244-inches in length, 86-inches in width, 79-inches in height). Metallic door handles punctuate the sculpted sides; lip moldings add presence to the 22-inch polished aluminum wheels; and the mirrors boast both skull caps and dual-glass lenses. Ford then pairs all of this with an available twin-panel sunroof - bringing sedan-worthy styling to the half-ton market. The 2019 F-150 Limited will thrill from every angle. Want to take it for a spin? Visit our dealership today to learn more about this F-Series platform! The Go Further philosophy demands more than V8 power. Instead Alberta drivers are all too aware of the dangers of all-terrain adventures - the unsteady miles and sudden curves, the waves of fog that always seem to roll in. There’s trouble on the horizon. Let the 2019 F-250 help you defeat it. 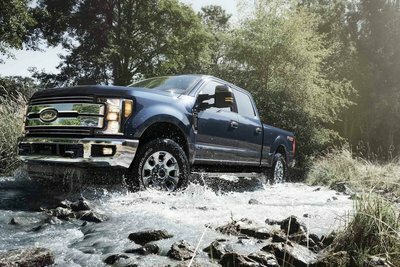 According to Trucks.com, the new F-250 delivers far more than heavy-duty performance (385 HP and 430 lb.-ft of torque). Instead it emphasizes safety, introducing drivers to a bevy of advanced technologies. Roll stability software anchors the chassis, utilizing gyroscopic sensors to detect sudden trajectory changes or unsteady pitch rates (it then adjusts the suspension accordingly to ensure smooth alignments). Trailer sway functionality enhances brake responses, engaging the ABS whenever payloads begin to strain the engine; while adaptive cruise control moderates speeds. LED lighting casts wide beams across the ground, maximizing visibility in even the thickest fog; and blind-spot monitors provide real-time traffic assessments, instantly alerting operators to the approach of another vehicle. Further improving the backroad experience is the SOS Post-Collision notification system - which, in the event of an accident, automatically deploys the F-250’s hazard lights and horn. This ensures that passing drivers can quickly identify the truck’s location and stop to help. The 2019 F-250 proves ready for every adventure - delivering premium safety to Alberta. To learn more about this F-Series platform contact our team today. The trailer is long - stretching out across a driveway, stuffed to the brim with heavy cargo. You eye it speculatively, wondering how you’re meant to haul such a thing. The hitch on your mid-size pick-up surely won’t suffice. Ford agrees - which is why it recommends upgrading your payload experience with the 2019 F-350. According to Trucks.com, the new F-350 Super Duty proves ready for every demand. Anchoring its massive frame (266-inches long, 96-inches wide, and 81-inches high) is a 6.2L V8. This Flex Fuel powerpoint delivers impressive capability, generating 385 HP and 430 lb.-ft of torque. Its mid-range design enables drivers to achieve a full redline surge (5,750 RPMs) with greater speed, reducing overall friction strain; while the custom-tuned induction system enhances sequencing. The eight-cylinders are bolstered by SOHC technology, and the 9.8:1 compression ratio assures potent responses. Mated to a heavy-duty six-speed automatic transmission, the 2019 F-350 connects operators to the payload performance they need: earning up to 21,000 pounds of traditional trailering and 32,000 pounds of goosenecking. No haul will prove too much for this platform, with its 18-inch aluminum wheels instead rolling smoothly over every mile. In need of class-shattering strength? Visit our dealership today to learn more about the 2019 F-350 Super Duty (as well as other F-Series models, including the F-150 and F-250)! It’s a stumbling rhythm - with each press of the pedal yielding slow speeds and halting accelerations. Your pick-up wheezes down the road, unable (and unwilling) to deliver the quicksilver performance you crave. Ford thinks it’s time for something better. Slip behind the wheel of its 2019 F-150 Limited and discover segment-shattering capability. According to Car and Driver, the new F-150 will defy all expectations - fusing its half-ton design with sport-inspired power. 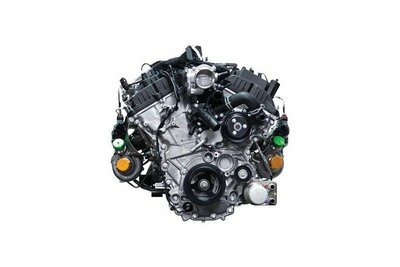 Ford has paired this platform with a robust 24-valve 3.5L V6. Twin-turbochargers anchor the engine, yielding enhanced sequencing; while direct-injection technology delivers optimal fuel levels to the block, assuring a stable performance-band. A 10-speed automatic transmission promises seamless gear control; and the potent 4WD provides balanced responses, effortlessly distributing metrics (450 HP and 510 lb.-ft of torque) between the wheels as needed. This connects Alberta drivers to the track-worthy performance they crave - with the 2019 F-150 Limited generating a top-speed ratio of 107 MPH. It shatters all records, with its 0 to 60 blitz demanding a mere 5.1 seconds; and it achieves a rolling start of only 5.7 seconds, leaving the competition in the dust. With the release of the new Limited Ford injects much-needed fun into the half-ton market. To learn more about this pick-up contact our team today!